This procedure is not about changing the identity of the way you look but all about finding your expressiveness and personality. Indeed, the eyes are a very important part of your personal identity. If you have not met someone’s gaze, it can be hard to recognise them. For this reason, I do not prioritise creating smooth skin at any cost but preserving the natural appearance of your original look. For men, the eyes must not look severe but authoritative, which reflects a man’s experience and strength of personality as well as their maturity. This can be important in a professional environment where a man needs to assert himself by exuding a certain authority. I therefore use incision lines and techniques that may be different from those used in women. One of the most frequent reasons for a consultation is the change in the way the eyes look due to eye bags, dark circles, excess skin and sagging to the upper eyelid skin and eyelashes, casting a shadow over the eyes which then makes someone look tired, sad or stern. Sagging of the external part of the eyebrows. Indeed, the external part of the eyebrow must be above the orbital bone arch or at least at the same level. If the outer part of the eyebrow is below the arch, this makes eye sagging look worse and can be further accentuated by skin removal from the upper eyelid. To solve this, we must also perform upper eyelid plastic surgery, raising the external part of the eyebrow. I use the temporal Curl-lift technique (tension threads), which only leave 2mm scars and these are hidden in the scalp without causing any hair loss. Lower eyelid plastic surgery can also correct sagging cheekbones as well as a swelling called "malar bags", which form a double contour under the fatty pockets of the lower eyelid. These malar bags, like bags under the eyes, inflate or deflate according to the lifestyle you are leading (lack of sleep, excess food or alcohol, tobacco, stress...). When they become permanent, despite a balanced lifestyle, they can be corrected with lower eyelid plastic surgery and a malar Curl-lift (tension threads). Simultaneously enhancing the eyelid and cheekbone, this allows a more balanced and natural result. Correcting one defect may accentuate another defect in the same anatomical region. For general anaesthetic, you will have to fast strictly for 6 hours before the operation (do not eat anything, chew gum, eat sweets or smoke). If, however, you are having a local anaesthetic, you can drink and eat lightly at normal mealtimes. Before you go to the operating theatre, in your room, I will go over the precise goals with you that we agreed during the consultations. You can then always make recommendations and ask any questions. I then draw the lines and marks on your skin to guide the operation and the lines of the incisions. 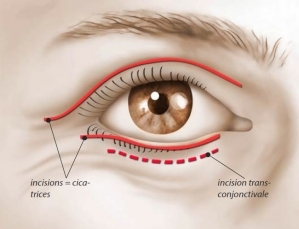 Fat pockets are removed by an incision usually made inside the eyelid (trans-conjunctival method). 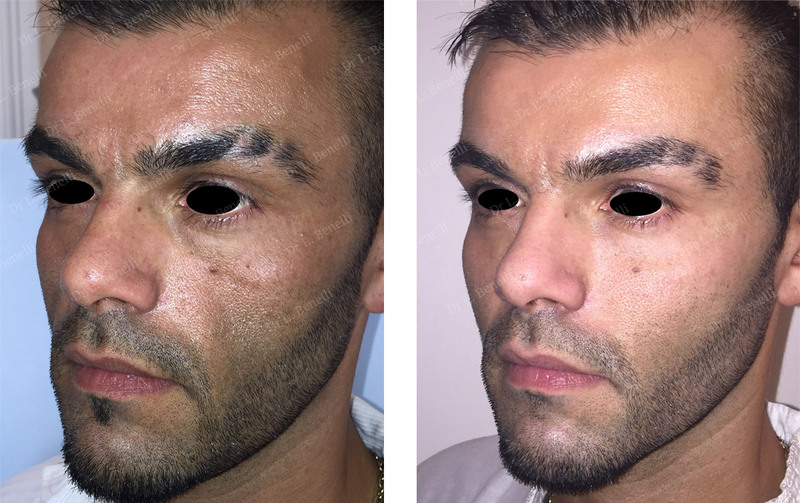 This ensures that there are no scars on the skin and avoids a frequent complication caused by a skin incision on the edge of the lower eyelid which, even without removing skin, can cause scar retraction on the edge of the eyelid, giving a round eye appearance that's to be avoided at all costs. On returning to your room, patients who have received local anaesthetic can have a small snack and, after a period of monitoring, can go home without a bandage and just a simple pair of sunglasses and possibly a scarf around the face to avoid draughts on the area that was operated on. Any pain is very moderate and, most of the time, analgesics are not needed. What may bother you the most is the swelling of the eyelid (oedema), which varies according to each individual and is usually accompanied by a small bruise. This takes about ten days to disappear almost completely. You can hide this, however, with suitable cover-up cream, designed for post-operative use the day after the operation. You can, though, only apply these products directly to the scar from the 5th day following the operation. As the stitches used are absorbable, they do not need to be removed. They are invisible as they are placed inside the skin’s thickness (intradermal stitches). Exposure to the sun: no direct exposure for 1 month, then exposure is allowed using sunglasses a sunscreen with a maximum protection factor. You can hide any bruises with a cover-up cream the day after the operation. These products can only be applied directly to the scar 5 days after the operation. The products must be adapted and designed for post-operative use. They will be prescribed to you on a post-operative prescription. The result is a relaxed, rejuvenated face, giving you an undeniable feeling of well-being. Those around you will notice a change and an improvement, thinking that you look well, but without necessarily being able to see that you have had an operation.